FIFA means Fédération Internationale de Football Association. This is a game that is played by only male teams that are members of FIFA. FIFA World Cup 2018 will be the 21st World cup to be held. It is a game that is contested by male member of teams that are of the FIFA Federation.The FIFA World Cup 2018 is scheduled to take place in Russia, this is after the country was awarded the hosting rights in 2010 December. The last FIFA World Cup to be held in Europe was back in 2006 in Germany. The game involves thirty two national teams from the start. Thirty one of them being determined through qualifying competitions and rest being the host teams that automatically qualified . 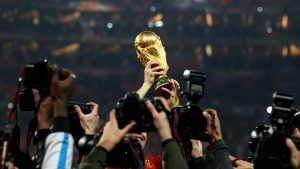 Twenty of the teams including defending champions Germany will be making back to back appearances while Panama and Iceland will be making their first appearance at a FIFA World Cup. The matches will be played in twelve stadiums in eleven different cities around Russia but the final game will take place in Luzhniki Stadium in Moscow on 15th of July 2018. The trophy has finally arrived in Kenya. It arrived with some FIFA officials on 26/02/2018 at the Jomo Kenyatta International Airport. The trophy will be in the country for a two day tour. Funs will be allowed to take photos with it. Kenyan president Uhuru Kenyatta is expected to grace the event.the trophy will be in the country for the third time since its first time in 2009. The tour targets fifty one countries and ninety one cities. 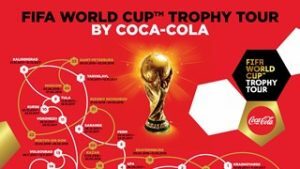 the tour is a partnership between FIFA and Coca Cola. The tour is always flagged off by players who have won the world cup in their football career.